Unfortunately for me, today marks the last full day of my lovely vacation in Lake Chautauqua. It has been, and always is, a fantastic break from the real world. Now to prep for the long drive home, woohoo! I'm sharing a card for the Unity Stamp 'Friends With Flair' post. It uses papers and coordinating stamps from one of my all-time-favies Echo Park "Springtime" collection. The white background was stamped with raindrops and the cute sun. I stamped the umbrellas separately and colored with Copic markers, then fussy cut and adhered to the raindrop pattern paper. 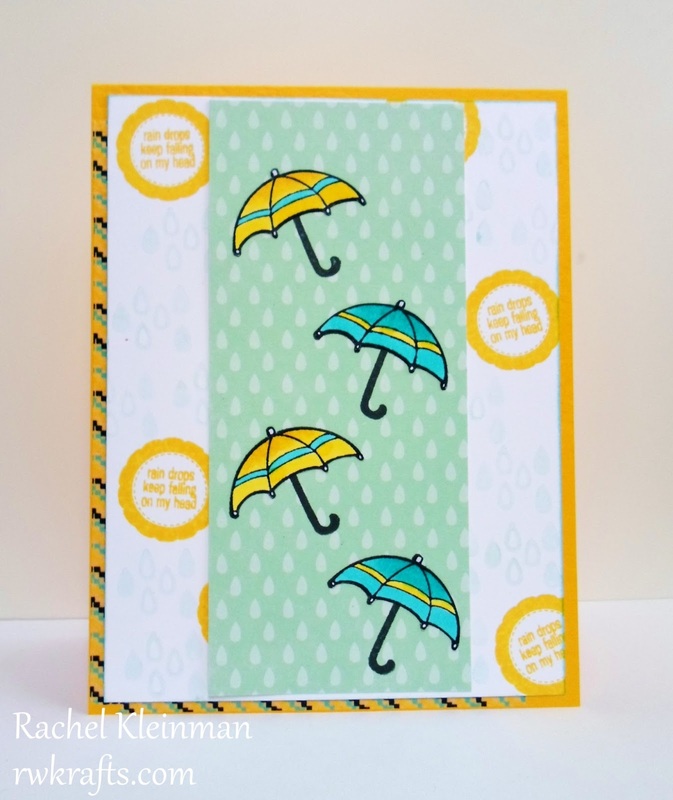 I used a fun blue and yellow washi tape to border the corner of the card. 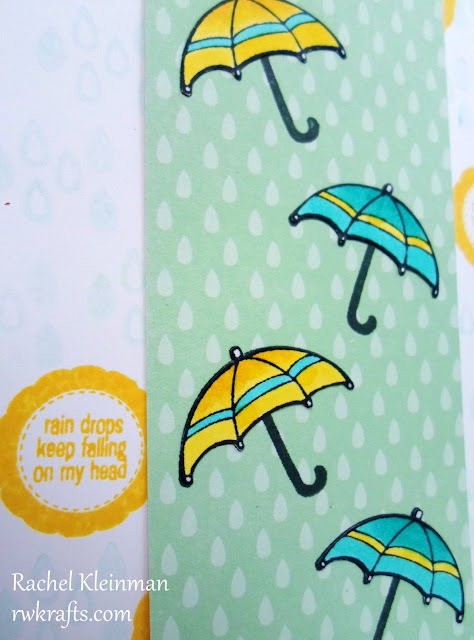 Unity Stamp Co "Sunshine Makes me Happy"
Inks: Hero Arts "Soft Pool", Memento "Dandelion" and "Tuxedo Black"
So cute, love those umbrellas! Cute card! Love that song! this is super adorable!!! Love love the umbrellas and the sentiment. Lovely! The colors are wonderful and the design is spot-on. Ha, I love umbrellas!!! Rain makes me so *happy*! (Probably comes from living in the desert...we get about 2" a year here! I love this EP collection, too. Those umbrellas are awesome! Great card! Love this color combo! PA feels like the tropics this past week, so never without a cute umbrella. Great song, and a great card! I just love those colorful little umbrellas!! Super cute card! Love the umbrellas. Fun! Fun! Fun! Awesome colors! Great work coloring!!! What a darling card! I love the idea of using umbrellas on that - fantastic! Great card. I was going to be doing a "rain" theme this week. I love the colors you used!! 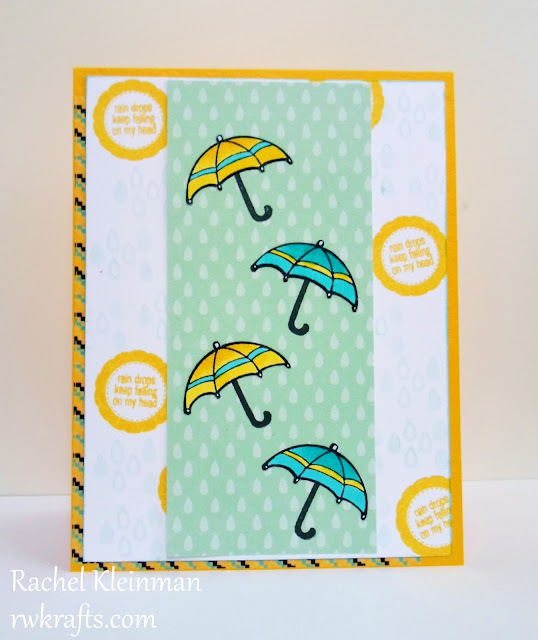 What a FUN card, Rachel!! Love the umbrellas, and how pretty they look. Have a great week!! Too cute!! 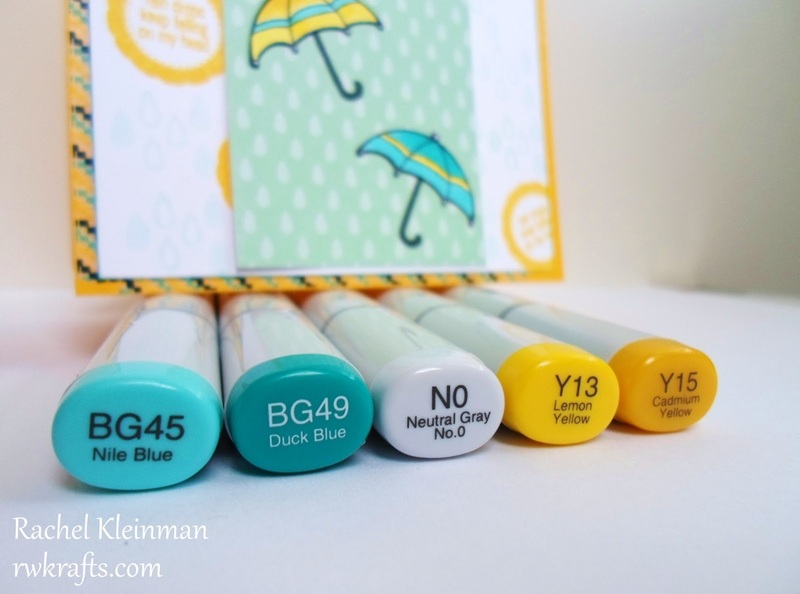 Those umbrellas are adorable and I love those stamped raindrops! !